Providing you the best range of dx5 high speed eco solvent printing machine, eco solvent printing machine 6 feet and wall paper printing machine with effective & timely delivery. 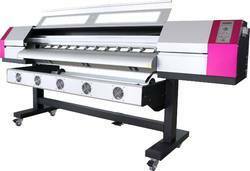 We are offering Galaxy DX5 High Speed Eco Solvent Printing Machine to our clients. 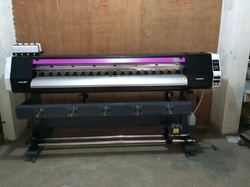 Epson DX5 high quality Japan imported print head machine. 120 Sq.ft / Hour Speed in Single head. 240 Sq.ft / Hour Speed in Dual heads. 2 years outdoor warranty for ink. 1 year machine warranty for machine. New version upgrade model 2018. Galaxy Japan Epson DX5 printing machine. Speed starts with 120 Sq.ft / Hour. Our firm specializes in offering an excellent range of Wall Paper Eco Solvent Printing Machine. Our entire product range is in sync with international quality parameters and we strictly adhere to all the quality guidelines. To maintain industry defined quality standards, this product is manufactured using quality proven raw materials and cutting-edge technology at vendor’s end. Also, this printer is examined properly by our quality controllers upon distinct parameters of quality. Looking for Eco Solvent Printing Machine ?